Montse Guitert Catasús, principal investigator of the Edul@b research group and Professor of Psychology and Educational Sciences of the Open University of Catalonia (UOC) has received the Jaume Vicens Vives distinction of the Government for the leadership in the online training on digital competences in the university environment and its impact on citizens. 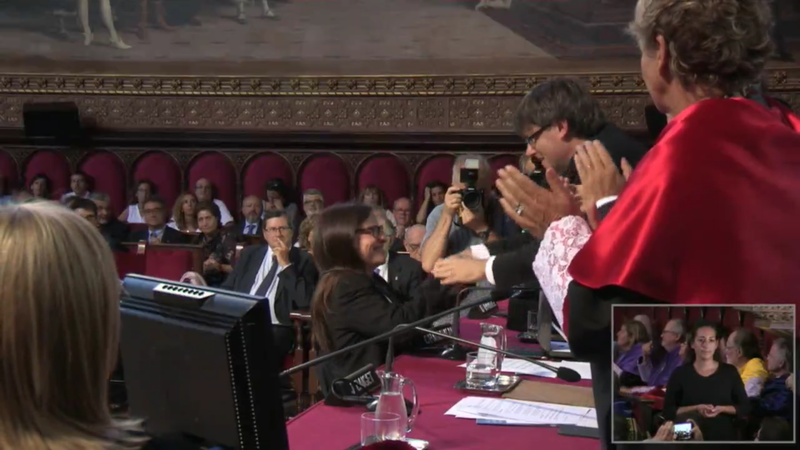 The delivery of the awards took place during the opening ceremony of the course 2016-2017 for the Catalan university system held in the Auditorium of the Historical Building of the University of Barcelona (UB). To Guitert, this award represents the recognition of a career that began over twenty years ago in the emerging field of education and ICT: in 95 he was commissioned to design a cross-cutting issue for the first pilot of the UOC course: Multimedia and Communication (MiC). It was intended to facilitate work and study habits in the learning environment used in the virtual campus and the office automation tools needed to study at the UOC. Until today it has been already trained more than 70,000 students, with an average of 4,000 students per year that have been initiated in the acquisition of digital competences.